The plus-size iPhones display the Scrivener project binder in a small sidebar. Here it is, nearly July—and that means it’s New Phone season if you’re an iPhone user. You may wait until mid-September to get the latest and greatest straight from Apple’s development labs. Myself, I like to snipe for bargains in late August as the phone companies discount Apple’s older models, which will likely be discontinued or released with different (usually smaller) storage configurations. 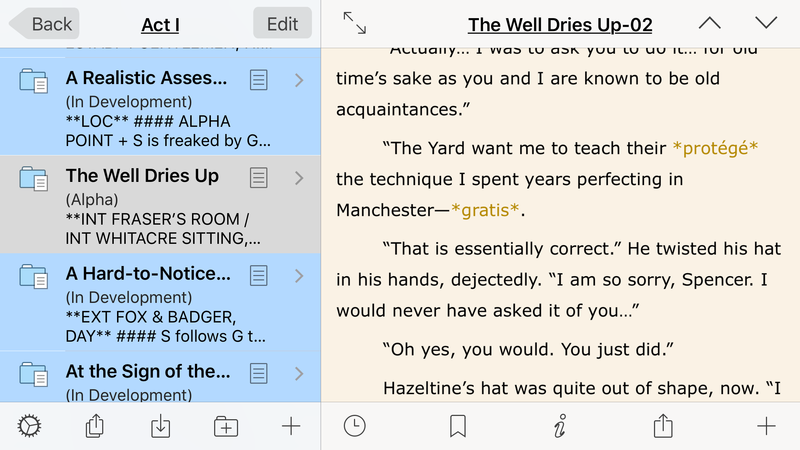 But if you’re a Scrivener iOS user and have a small iPhone (iPhone SE, or any of the iPhones 5) or a medium-sized iPhone (6, 6S, or 7)—there are some little-known capabilities of Scrivener iOS on large iPhones (6 Plus, 6S Plus, and 7 Plus) that may influence your new phone decision. 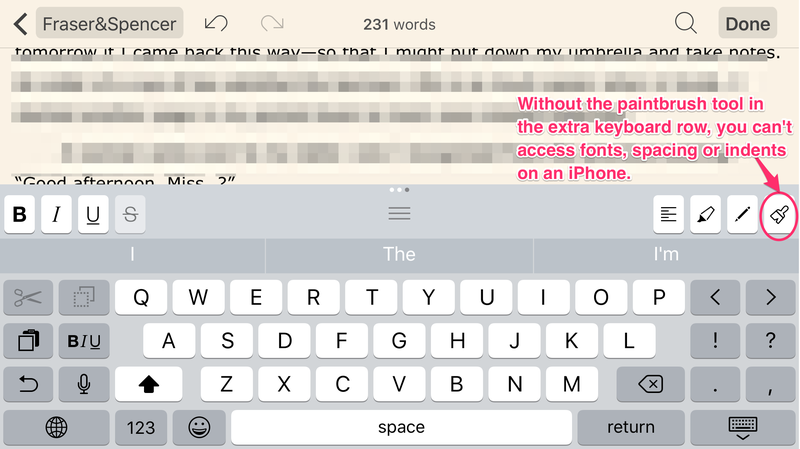 A small iPhone (1136‑by‑640‑pixel resolution—example: iPhone SE) won’t even display Scrivener’s extra keyboard row in landscape mode, for the simple reason that if it did there would be no room on the screen to display text. 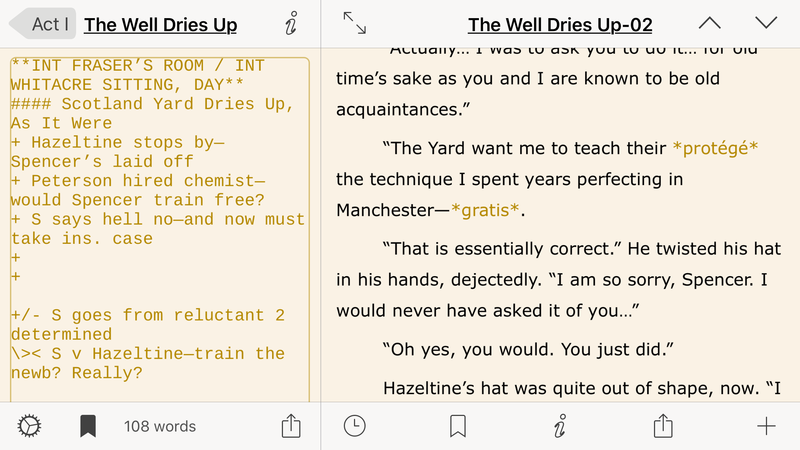 Because several formatting functions can only be accessed from that keyboard row on an iPhone, as a practical matter, Scrivener can only be used in portrait mode on a small iPhone. Medium iPhones (1334-by-750-pixel resolution—example: iPhone 7) get that extra keyboard row in landscape mode. With that increased screen space, Scrivener can be used effectively in any orientation on a medium iPhone. If you’ve used Quick Reference in your project in iPad Scrivener, those files will be available as Quick Reference items for your iPhone Plus binder. Keith Blount of http://literatureandlatte.com says that for the next Scrivener iOS update, Quick Reference will be enabled for Plus-size iPhones! Huzzah! I’ve gone ahead and gotten myself an iPhone 6S Plus, not even waiting for August—I wanted to lock in the 3.5mm headphone socket before it disappears from the product line, as well as enjoy the sidebar in Scrivener. Happy phone shopping!